When we began restoration of our historic 19th century Oakville farmstead, we added our trio of significant barns, each with its own particular magic and purpose. 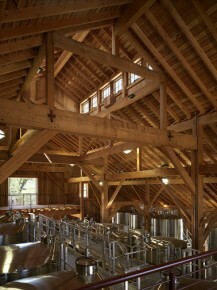 The two fermentation barns are constructed using old post-and-beam, mortise and tenon construction methods, with architecture inspired by old dairy barns. The barns house an assortment of small, custom-sized, open and closed-top stainless tanks, which handle the many small lots of wine that come from our harmonious collection of vineyards. Post-and-beam, mortise and tenon construction add beauty and a sense of history to the interior view of our South Fermentation Barn. The third barn is regarded as our crown jewel—a beautiful, hand-hewn barn that was built in the Colony of New Hampshire (yep – pre-Revolutionary War!). 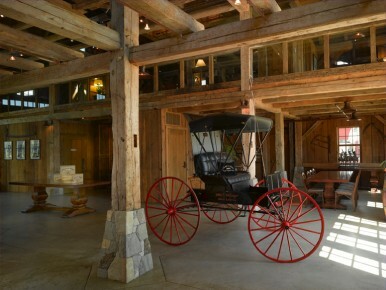 We went back to New England in search of a wonderful barn to restore and add to our farmstead. We found the tired, old barn, had it restored and then shipped it cross country to be re-assembled by the crew of Vermonters who make up The Barn People—a company which rescues and preserves these wonderful American treasures and helped us find the right building to round out our farmstead. 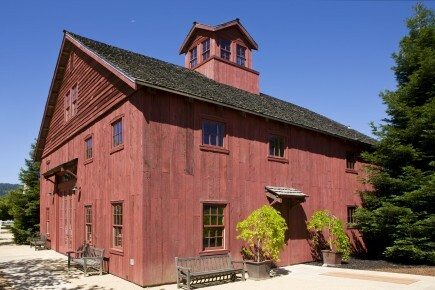 The Gleason Barn beautifully captures the historical and the modern, with the hand-hewn, centuries-old beams–now housing the enology lab and winemaking offices. We hope you can visit Nickel & Nickel when you are next in Napa Valley to see our marvelous interpretation of a state-of-the-art-winery within our historic and beautiful farm.